The Atlantic hurricane season lasts roughly from June to November. 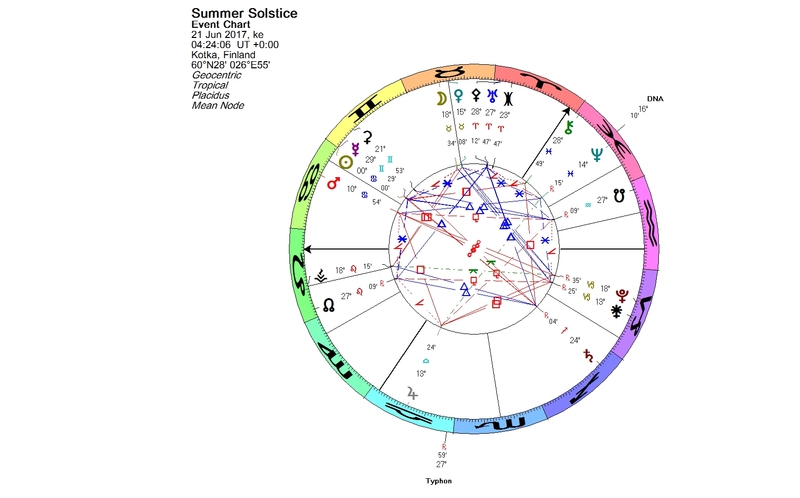 Uranus was exactly opposite 42355 Typhon already in the Summer Solstice chart. 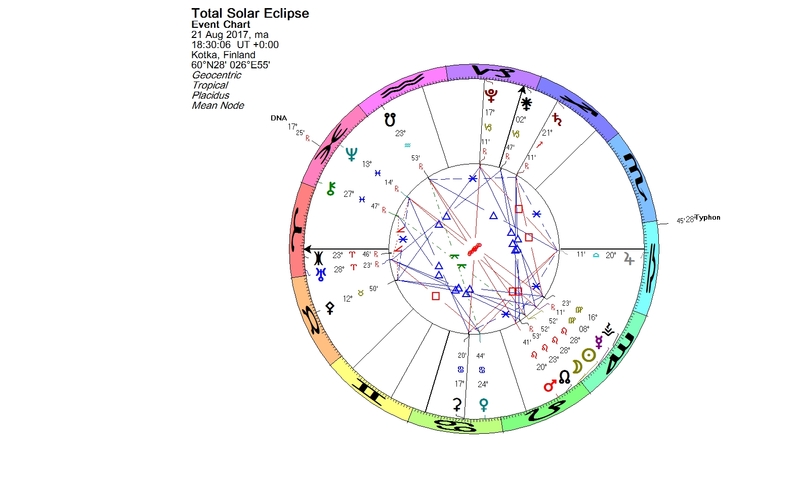 The total solar eclipse on Aug. 21 was tightly aspecting the Uranus-Typhon opposition. Typhon changed signs to Scorpio on Sept. 20, the same day that the New Moon in Virgo occurred. 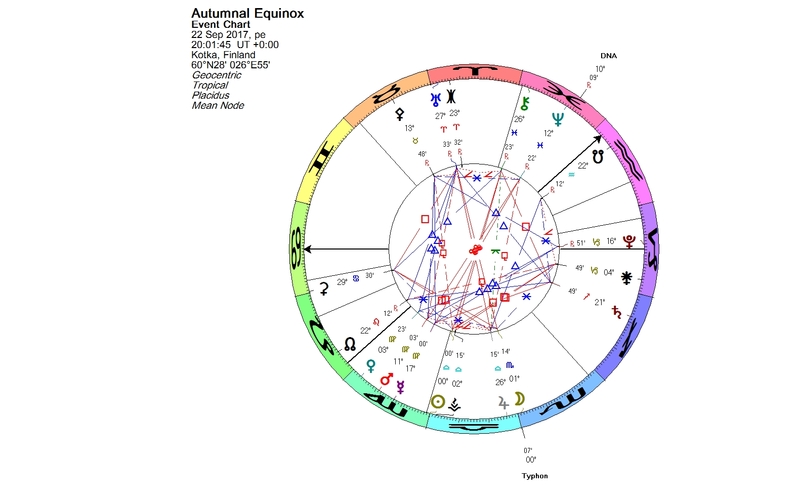 In the Autumnal Equinox chart on Sept. 22, the Moon was in conjunction with Typhon. Now, at the Aries Full Moon on Oct. 5, Jupiter was conjoining Typhon. In Greek mythology Typhon was huge. Since the summer all over the world there have been natural disasters on a large scale, which fit in the symbolism of Typhon: wildfires, hurricanes, floods and earthquakes. The joined remains of hurricane Lee and Maria reached even us in Finland, giving us a whole month’s worth of rain in a couple of days. The spiral shape is characteristic for hurricanes and typhoons. It can also be found in the double helix structure of the DNA molecule that carries the genetic code of all living organisms. Viruses also contain DNA, although they cannot naturally reproduce outside a host cell. In August 2017 the worst flu outbreak on record hit Australia. It is expected to turn into a pandemic. 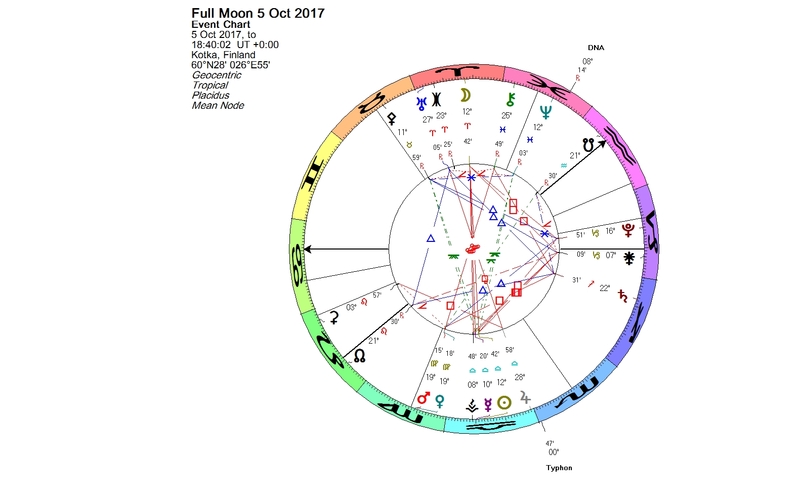 In the Full Moon chart on Sept. 6, besides the Uranus-Typhon opposition, asteroid 55555 DNA was in conjunction with the Moon (mutations) and Neptune (diseases). 42355 Typhon and the main belt asteroid 55555 DNA interestingly appear in the charts of many pandemics. 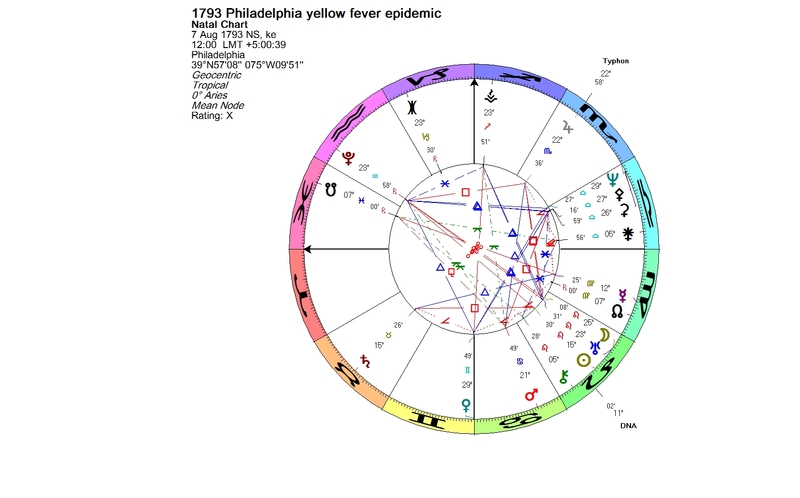 More than 4000 people died in the yellow fever during the epidemic of 1793 in Philadelphia. Two of the early cases were treated on Aug 7, 1793. 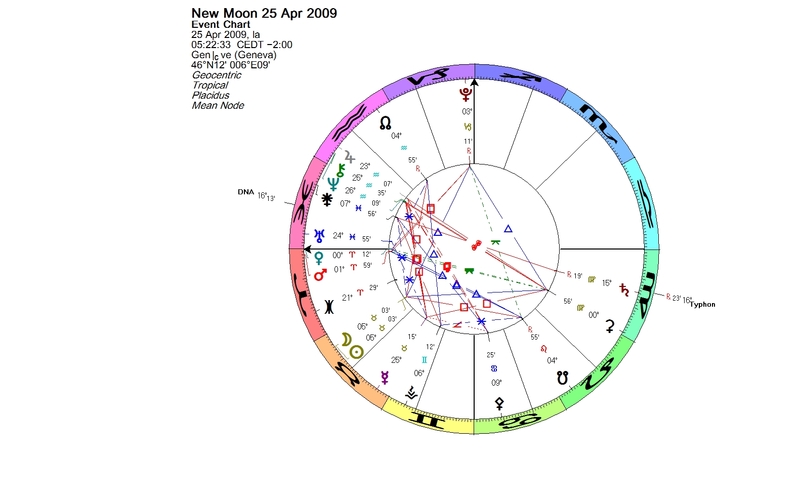 In the chart Jupiter (expansion), Uranus (sudden events) and Pluto (viruses) were forming a t-square. Jupiter was in exact conjunction with Typhon in Scorpio. Mars (fever, infections) was in trine to the Jupiter-Typhon conjunction. The first recognized cases of AIDS were reported by The Centers for Disease Control and Prevention on June 5, 1981. Five homosexual men in Los Angeles were reported to have a rare form of pneumonia seen only in patients with weakened immune systems. In the chart Typhon is in conjunction with Chiron in Taurus and in a wide opposition to Uranus at 27+ degrees of Scorpio. Also Mars (infections) and asteroid DNA, both in the first degree of Gemini, were opposing Uranus. Jupiter (expansion) in the first degree of Libra (one of the four Aries points, a point of interaction between the individual and collective) was in trine to Mars-DNA conjunction. Asteroid DNA, Jupiter and Typhon made a triple conjunction at 11+ degrees of Leo in late September 2002. In the middle of November 2002, DNA opposed Uranus on the axis of 24+ degrees of Leo/Aquarius. The Sun-Mercury conjunction in Scorpio was at the midpoint completing the opposition aspect to a t-square pattern. The epidemic of SARS (severe acute respiratory syndrome) appears to have started in China on Nov. 16, 2002. The first case of infection was speculated to be a farmer in Foshan County. The Jupiter-Typhon conjunction was opposing Neptune in Aquarius in February 2003. On March 12, 2003, WHO issued a global alert. The Sun was squaring Pluto at the time. 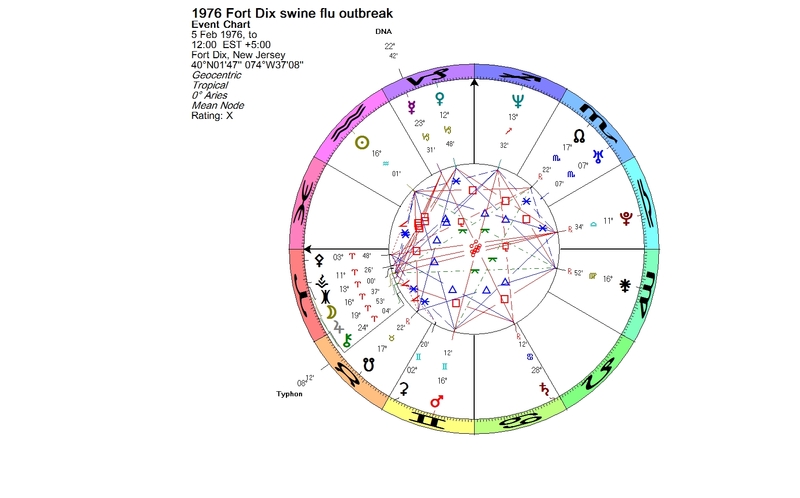 The 2009 swine flu influenza reached the media spotlight around the time of the Taurus New Moon on April 25, 2009. Asteroid DNA was at 16+ degrees of Pisces opposite Typhon. Mercury (lungs) was in tight sextile to Uranus and trining the triple conjunction of Jupiter, Neptune and Chiron in Aquarius. Mars (infections) was at the Aries Point. On June 11, 2009, WHO raised the alert level to phase 6 and announced the pandemic. 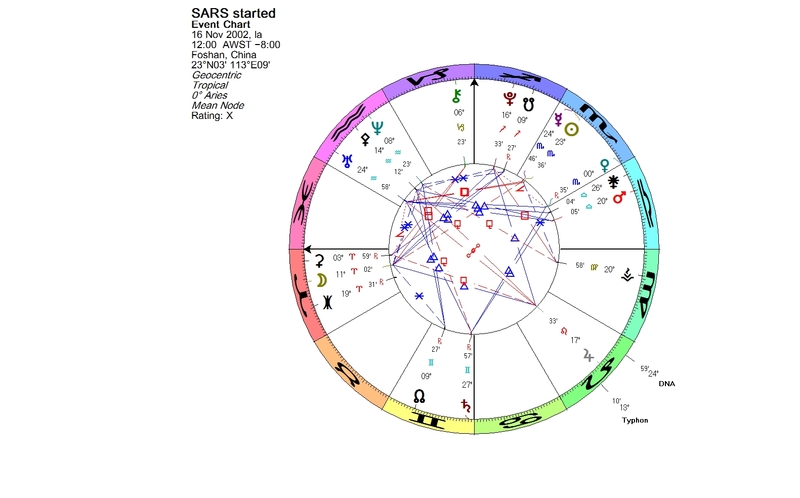 Because Mercury had been retrograding in May, it was in sextile to Uranus and in trine to the triple conjunction of Jupiter, Neptune and Chiron in June for the second time. There was also a swine flu outbreak on Feb. 5, 1976, in Fort Dix, in the U.S. Army installation. The epidemic mysteriously disappeared within a couple of months. Uranus in Scorpio was opposite Typhon in Taurus. Mercury was in conjunction with asteroid DNA in Capricorn. They squared Jupiter-Chiron conjunction in Aries. 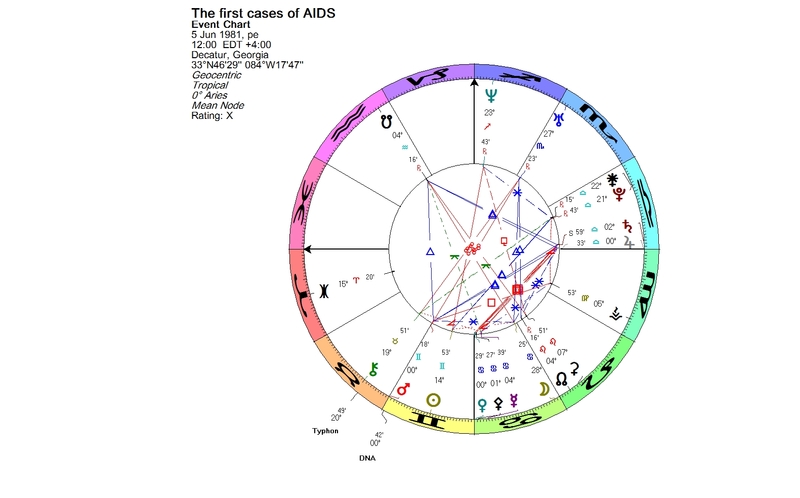 The Sun in Aquarius was in exact trine to Mars in Gemini (lung infections). According to the Online Etymology Dictionary, the Greek term typhos, which means smoke, mist or fog, is related to the Greek word typhon, meaning the whirlwind. The disease called typhus got its name from the Greek typhos, describing the state of mind of those infected. The extreme weather phenomena today reflect the collective psychic state of the humankind. The healing can begin only by us, the individuals. This entry was posted on Sunday, October 8th, 2017 at 3:35 am	and is filed under Eclipses, Equinoxes, Full Moon, Solstices. You can follow any responses to this entry through the RSS 2.0 feed. You can leave a response, or trackback from your own site.